Imagine a coconut beach in paradise surrounded by mountains cliffs and hills on one side and bounded by the aquamarine sea of the Phang Nga Bay on the other. This is the Loh Bagao and Lannah Bays. This is one of Phi Phi Island's secrets. Though it has the majesty of the main Tonsai Village, Loh Dalum Bay (Dolphin Bay) and Tonsai Bay, it is not in the classic view of Phi Phi island, a photograph taken from Phi Phi Island's main View Point. As there is no deep water pier and a village less than a 50th the size it is not well know celebrated or crowded. This in fact is it's attraction. This whole area is larger than Tonsai and so with so little happening in such a large area it is quiet and peaceful. Tonsai has almost 1500 hotel rooms but Loh Bagao and Lannah Bay have only 104 at the Phi Phi Island Village Resort and Spa and Phi Phi Island Village Resort Hillside Villas. The start of 70 rooms of the hillside villas from the hotel chain Sofitel is the only other change to this coconut grove. The coral> off Loh Bagao is better just to the south of the Bay towards Ao Pak Nam. Lannah Bay coral is difficult to get to but in good condition in high season. 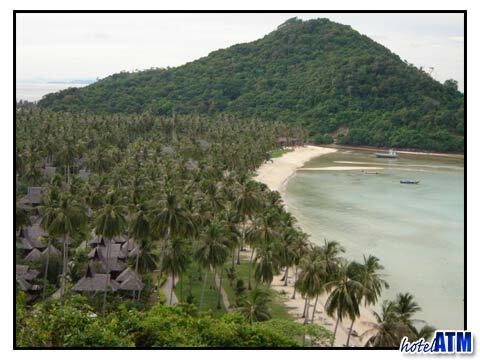 Hin Klang in front of the Holiday Inn Phi Phi Island Resort and Phi Phi Natural Resort is the islands best. 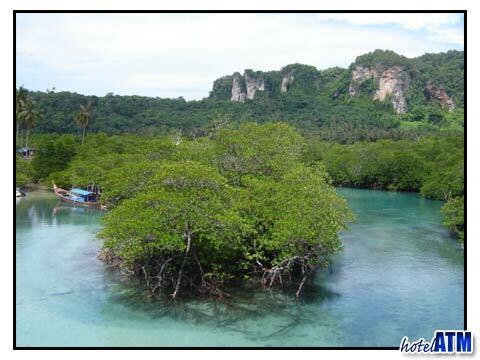 The reef is in the middle of the sea and enjoys quite strong tides and but is recommended to those who are experienced. There are many things to do and see from these bays but the trekking or tramping must be the most impressive. There is the obvious and easy trek up on the north east coast to Laem Tong peninsula. 2-3 km one way. The Local view point just above the dive center (over the bridge, turn left to Lana Beach Sign and look for a sign to the right). This has wonderful views of the cliffs behind the Phi Phi Island Village Resort and Spa and also the cliffs over Tonsai Village). The climb is about 200m and requires some walking experience as the path is not so clear on the descent. Walking shoes should be used. 3. The walk past Lana Bay to Nui Bay takes you from the west side of the beach, takes you up a small rise of about 40m and down to Nui beach framing camel rock and some wonderful snorkeling October to April. This is an easy rock but worth taking shoes as the rock over to Nui bay is sharp. Walk to Ao Phak Nam or Relax Bay Bungalows. The path goes south from the Phi Phi Island Village Resort and Spa and takes you past the Sofitel and immediately cuts uphill to take you away from the slippery rocks on the sea shore. Following a well trod trail you reach Ao Pak nam in about 20 minutes. The walk to Top View Point is hard because you are going uphill and secondly difficult to get on the right track. Go to the top of the Sofitel road and look for a track into the bush. Head south and you will find a track that take you along the top of a very soft drop off for about 2km. After a while you will see the Top View Point which is Phi Phi island's best as you can see both sides ie Tonsai Bay and East out towards Krabi, Koh Lanta etc. This place is marked by a radar beacon placed hear by the army after the Tsunami. Phi Phi Don Island: Laem Tong Beach, Loh Bagao Bay, Long Beach, Monkey Beach (Yung Gassem), Tonsai bay, Phi Phi Ley Island: Loh Samah Bay, Maya Bay.